Our specialists, dentists & therapists will strive to care for your children like we would our own. 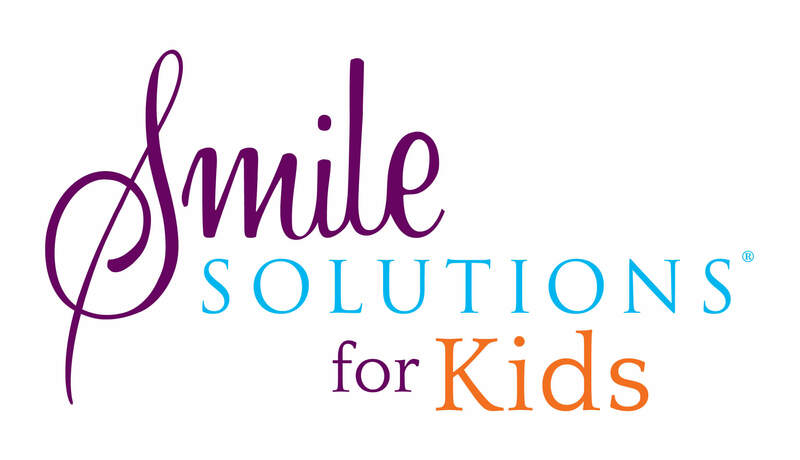 At Smile Solutions for Kids we take very seriously the privilege of caring for your children’s teeth, along with teaching them about good oral hygiene and preventative dental care. Children’s dental care is quite different from adult dental care, with the variables including age, cognitive development and personality type. Going to the dentist for the first time can be a strange experience. That is why it is important to make that experience as positive as possible, so that seeing a dentist does not produce feelings of anxiety. Also crucial is the fostering of good oral hygiene from a young age, establishing habits that will result in good dental health for life. We advise parents to introduce their child to professional dental care from the age of three. This is as easy and pleasant as taking them with you for your own dental appointment and watching you have your teeth cleaned, or bringing them to their own appointment in which their baby teeth are counted and polished with a soft brush. Parents are urged to introduce structured at-home oral routines for their children, and there are several ways in which you can make such a regimen enjoyable for yourself and your child. Read our tips for cleaning children’s teeth here. When you accompany your child to a dental consultation, the dentist will discuss with you any treatment options that would be appropriate for your child and will create a personalised treatment plan if a problem is found. To ensure that any such problems are identified early, regular dental appointments are important – for children just as for adults. Frequent dental appointments will also help ensure that your child’s teeth and gums remain healthy. We recommend that you book your child’s first appointment when they are three years old. When your child visits us they will initially be seen by a dental therapist – a clinician who focuses on children’s dentistry and is skilled in helping your child to enjoy their visit. It’s important for this initial visit to be a positive, educational and happy experience as it will help your child approach the dentist with little or no anxiety in future. To find out more and learn about how you can prepare your child for the dentist, visit our first visit page here. The Australian Government’s Child Dental Benefits Schedule (CDBS) provides eligible families with up to $1000 worth of basic dental treatment for children aged 2 to 17 years. The CDBS offers individual benefits for a range of dental services – including examinations, X-rays, cleaning, fillings, root canal treatments and extractions. Eligibility for the Chid Dental Benefits Schedule is externally determined by Medicare through means testing. To find out if your child qualifies, visit the Department of Human Services website here https://www.humanservices.gov.au/individuals/services/medicare/child-dental-benefits-schedule. If Medicare deems your child eligible, they will send you a letter confirming this. Please bring this letter to your appointment. You will need to pay in full for your child’s appointment on the day and then claim back the entire cost (up to $1000) of your child’s procedure through Medicare. To book an appointment with us, contact us on 13 13 96. Should I Take My Child to a General Dentist or a Specialist Paediatric Dentist? You can visit a general dentist or dental therapist for your child’s dental check-up appointments. If your child is found to have any dental problems we recommend they see a paediatric dentist. Paediatric dentists are registered specialists with three to four years’ additional training in children’s dentistry. They focus on the growth, development and treatment of children’s teeth, as well as decay prevention. 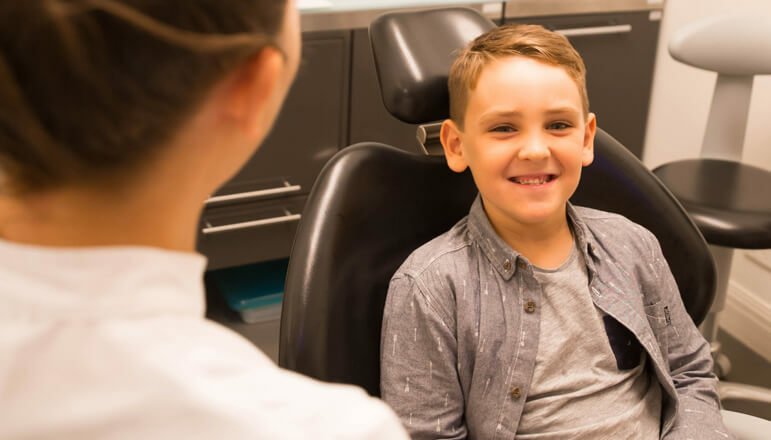 A large component of paediatric dentistry involves understanding child psychology and establishing trust through child-friendly communication styles and environments, so these clinicians are better equipped to put your child at ease. 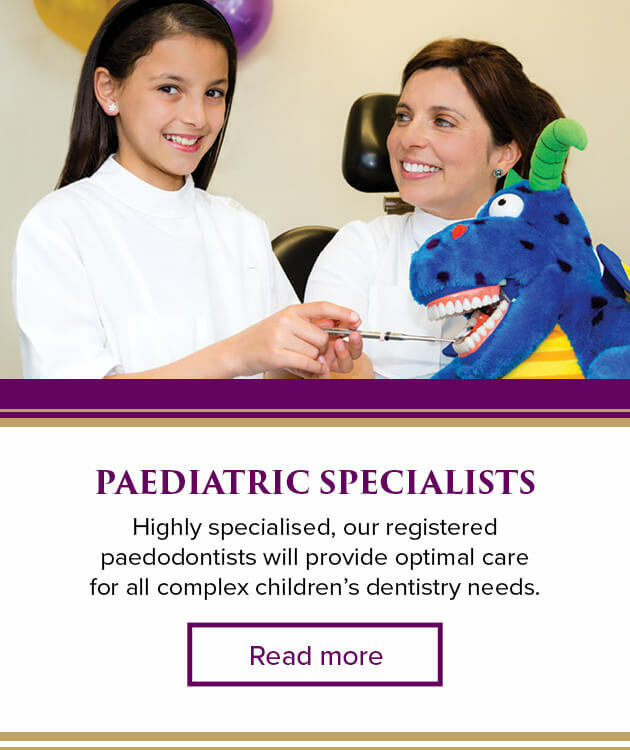 Our specialist paediatric dentists will look after all of your child’s dental needs. Read more about paediatric dentistry on our paediatric dentists page. At Smile Solutions, we have our very own Tooth Fairy to educate children on the importance of dental hygiene. 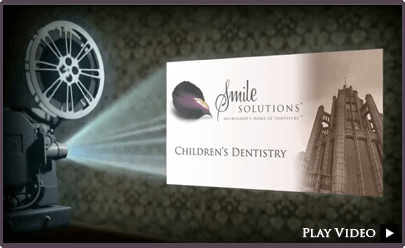 The Tooth Fairy program is a free educational initiative, funded solely by Smile Solutions. It was created to reflect our belief in the importance of preventative dental care and starting children on the right path to good oral health at a young age. By educating children about the importance of oral health and motivating them to care for their mouths, the program aims to reduce the number of Australian children suffering from preventable dental diseases. 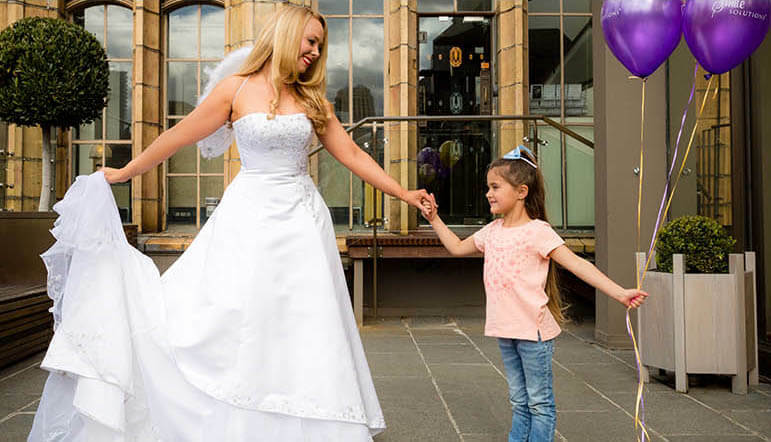 As part of this initiative the Smile Solutions Tooth Fairy, who is also a registered dental nurse, travels to kindergartens, schools and early learning centres throughout Melbourne to present a 30 minute educational show about basic dental care and good nutrition. We also host a dedicated Tooth Fairy website containing informative tips for parents and fun educational activities for children. Learn more about our Tooth Fairy educational initiative here. The first of a child’s adult teeth typically appear at around the age of 9 to 10, and this is also when some developmental problems of the teeth and/or jaws may require attention. 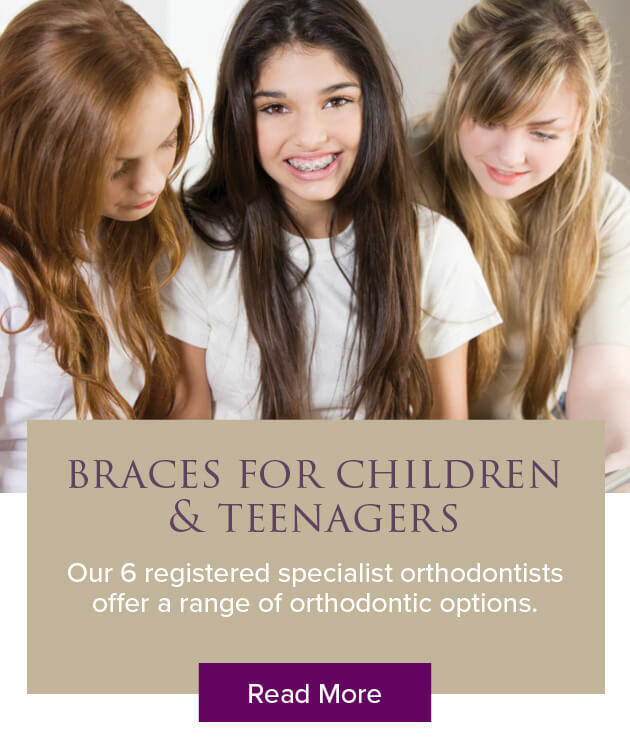 It is the age at which we recommend you book your child for an assessment by a specialist orthodontist. At Smile Solutions we offer the expert advice of any of our six specialist orthodontists. Treatment for young children is usually aimed at dealing with functional problems that immediately threaten the health of their teeth. Taking a proactive approach may prevent the need for orthodontic treatment later on or may shorten and simplify later treatment. The conditions we usually look for and treat in early childhood are tooth eruption, cross-bites, severe overcrowding, jaw growth problems, snoring and thumb sucking. To find out more, visit our children’s orthodontics page. In some children a growth imbalance between the top and bottom jaws makes it difficult or impossible to bite their teeth together correctly. This is often an inherited problem that can be fixed by expansion of either jaw, as well as promoting forward growth. 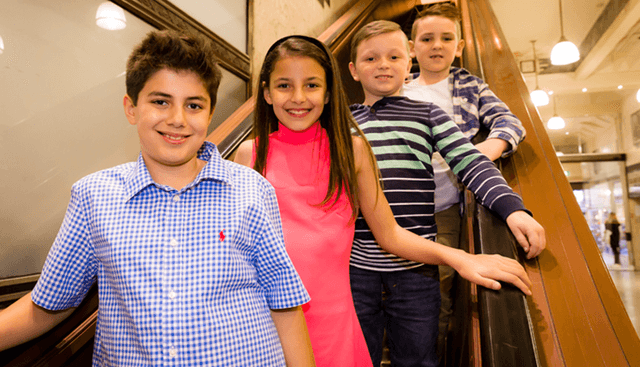 At Smile Solutions, our six specialist orthodontists work together with our oral & maxillofacial surgeons, Dr Patrishia Bordbar and Dr Ricky Kumar, in the effective management of children with jaw problems who might also require orthognathic (jaw) surgery. As you will be well aware, for active children of any age there are numerous situations in which a tooth can be knocked out or chipped. When a child presents with a missing or chipped tooth, a normal reaction is to panic. Fortunately, though, it can be possible to save the tooth if quick action is taken. Read our children’s dental emergencies page to find out what to do if such a situation arises. Who Would be Treating My Child? Our specialists, dentists and therapists all strive to care for the dental needs of your child as if they were our own. Our dedicated children’s dentistry team consists of general dentists, hygienists, orthodontists and registered specialist paediatric dentists. To read more about each of them, visit our team page. 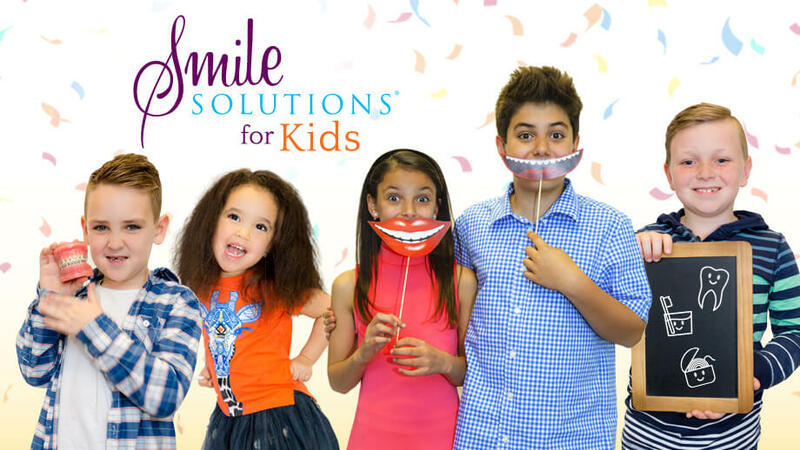 At Smile Solutions for Kids we know how important early experiences at the dentist are in forming your child’s attitude towards dental health. 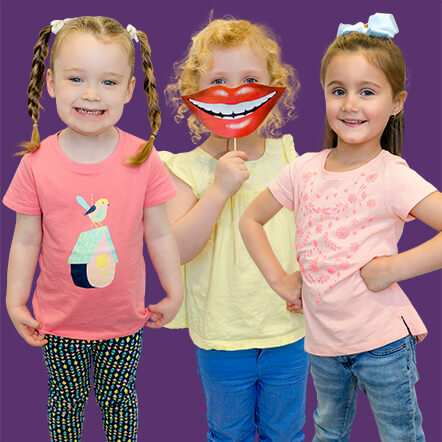 We tailor our services to the needs of children and do all we can to ensure they have a positive experience every time they visit us for their dental appointments. With the advantage of having dental therapists, hygienists and registered specialists all in the one place, Smile Solutions allows for seamless treatment when your child sees more than one practitioner, from a hygienist to our paediatric dentists or your child’s orthodontist. You won’t have to worry about taking your child from clinic to clinic for different treatments.